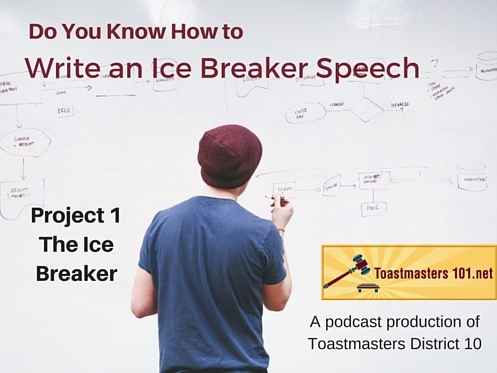 The first speech you’ll give in Toastmasters in the Ice Breaker, a speech about yourself. What do you want us to know about you? Whose Ice Are We Breaking? The first speech you give is the Ice Breaker, a speech about yourself. What’s your story? Don’t worry about the introduction or the conclusion until you know what you want to say in your ice breaker. Once you determine the two or three things you want to focus on, then you can perhaps find a personal story that fits into the speech framework. By using a story, you can then write the end of your speech by wrapping up your story, and then write the beginning of your speech with the opening of the story. What story do you want to tell us? Is it a personal history? Is it your career path? Is it what brought you to Toastmasters? We’re good with any of them. By building and using a story, you can create an effective opening and closing to your speech. Don’t forget your speech introduction for the meeting toastmaster. This is a courtesy given to the meeting toastmaster. The toastmaster is expected to give you an introduction that will prepare the audience for your speech. You wouldn’t want a humorous introduction for an emotional presentation, would you? The only way for a toastmaster to know how to introduce you is to have a written intro in hand. The toastmaster needs to know how to say your name – especially if it’s difficult to say based on the spelling. (We know who we are – our names are always mangled!) You should also give the name of the manual and the project number with the project title. This helps not only your evaluator (who will have your manual for the evaluation) but the rest of the club to know what you’re trying to accomplish. I have a timing tear off on the bottom of my intro that I give to the timer, especially if the timing isn’t the standard 5-7 minutes. Use this button to see the PDF versions of my Speech Introduction Forms. We wouldn’t mind if you were to subscribe via iTunes. If you can’t do that, we’d love a review. One More Thing: Check out Toastmasters.org so you can get access to the additional information and materials available on the website. Previous Previous post: Want to Improve Your Public Speaking? Consider Toastmasters. Next Next post: Organize Your Speech… Backwards?